In white with black interior. 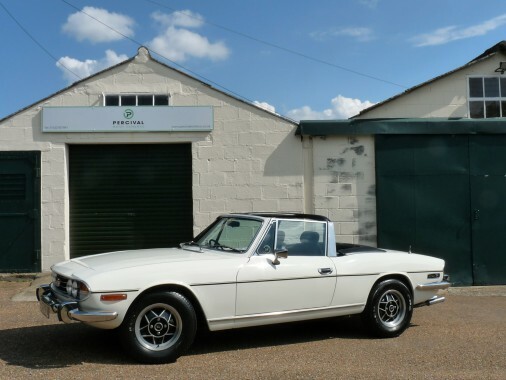 This very smart Stag is fitted with the desirable manual gearbox with overdrive. It has the correct 3.0 litre V8 Triumph engine which sounds beautiful. It is believed that the car has covered less than 46,000 miles since new which is backed up by numerous MOT certificates back to 1978. There is a good history file going back some years and the original Passport to Service booklet is present. In recent years it has had a bodywork overhaul with new wings and a superb respray, a new hood and replacement bumpers. A stainless steel exhaust is fitted, an electric engine fan and a nifty period Pioneer radio cassette.